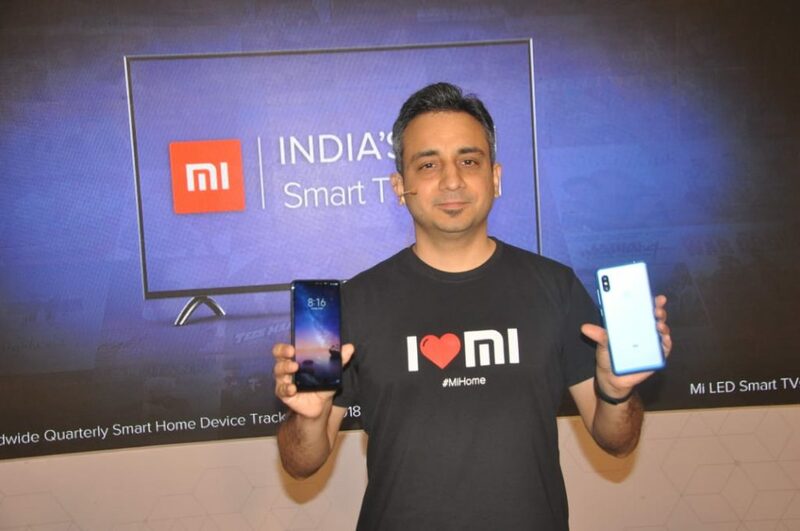 04 December 2018 — Xiaomi, India’s no.1 smartphone brand and no.1 smart TV brand, launched its recently announced Redmi Note 6 Pro and Mi LED SMART TV PRO series* in Lucknow. Adding to the excitement was the brand’s recently launched Mi Band 3, Mi Air Purifier 2S, Mi Home Security Camera 360°, and Mi Luggage which have gained widespread popularity across India. Since its smartphones entered the offline sector in 2017, Xiaomi has expanded its reach in the offline segment in the region. Lucknow has been performing extremely well for the brand, Xiaomi has also been receiving positive feedback from its Mi Fans in the region. Redmi Note 6 Pro features a company-first quad-camera setup in an all-around package. It comes with a two-day battery that Redmi smartphones are popularly known for, and for the first time brings an AI-powered quad-camera experience to the segment. Redmi Note 6 Pro is the successor to Redmi Note 5 Pro, the number 1 dual camera smartphone in India as per the Canalys report for July 2018. The Redmi Note 6 Pro already witnessed amazing response from customers with over 600,000 devices being sold in just one day of its launch during a special Black Friday sale. The Redmi Note 5 series recently crossed a record 5 million sales mark within just 4 months of launch in February 2018. Redmi Note 6 Pro sports the capable Qualcomm® Snapdragon™ 636 octa-core processor and comes with a 4000mAh two-day battery supporting Qualcomm® Quick Charge™ 3.0. For an all-new selfie experience, the phone features a 20MP + 2MP AI dual camera on the front, and a 12MP + 5MP AI dual camera setup on the rear with large 1.4µm pixels resulting in beautiful low light images. With portrait mode on both cameras ends and supported by Xiaomi’s new AI Portrait Mode 2.0, Redmi Note 6 Pro is truly a quad-camera all-rounder. It also comes with a 6.26” FHD+ IPS display and a 19:9 aspect ratio, and 500-nit maximum brightness, delivering stunning visuals. Moreover, it is equipped with dual VoLTEsupport ensuring great connectivity. Available in Black, Rose Gold, Blue, and Red colors, the Redmi Note 6 Pro 4GB + 64GB variant is priced at INR 13,999 and 6GB + 64GB variant is priced at INR 15,999. Furthermore, Xiaomi also showcased a range of ecosystem and lifestyle products that include the much-anticipated Mi Band 3, successor to Mi Band 2 series, which was one of the highest-shipped wearables, making Xiaomi the no.1 fitness wearable brand in the country with 46% market share as per IDC report (Q2, 2018). The company also announced Mi Air Purifier 2S which features a 360-degree tower design sporting a crisp OLED display. Additionally, in the smart living category, Xiaomi introduced Mi Home Security Camera 360° 1080P which is a home surveillance camera equipped with night vision, intelligent motion detection, and real-time two-way talk, wherein users can monitor their home’s real-time status. The brand also promoted its all-new Mi Luggage (20/24), another category first for Xiaomi in India. It is made from Makrolon™, a polycarbonate material that makes Mi Luggage extremely resilient. It also features the specially-designed TSA-approved combination lock making the luggage highly secure. This entry was posted in Launching. Bookmark the permalink.